The 'Rosary Pilgrimage' concept also provides a useful template for sharing some of my experiences of the Holy Land with you, dear reader. So in this blog post I'm going to say a little something about each of the places associated with the joyful mysteries of the rosary. The other sets of mysteries will be covered in following posts. Back when the angel Gabriel appeared to a young lady called Mary, Nazareth was an obscure little town, of which someone said, "Can anything good come from there? "(John 1:46). The population was maybe 400 or 500. Now it is the largest city of Galilee, with a population of about 76,000 - mostly Arabs. At 347m it is considerably higher than the Sea of Galilee (-215m), but lower than Jerusalem (754m). Hence the Bible speaks of Jesus going up to Jerusalem and down to Galilee. Some remains of the ancient houses lie in the shadow of the huge Basilica of the Annunciation, and it can be seen that they were constructed on top of and/or in front of caves in the limestone rock. These help to make sense of the fact that the traditional site of the Annunciation is a cave - because such spaces were actually part of people's houses (it also makes me think of hobbit-holes, which is not entirely irrelevant). 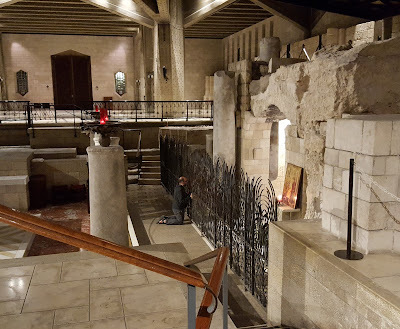 This particular cave or grotto is now part of the lower level of the twentieth-century basilica, and clustered about with some remains of the Byzantine and Crusader churches. 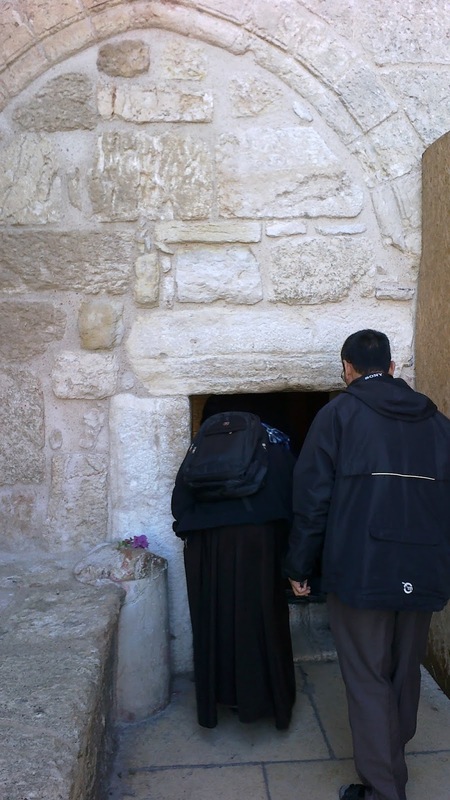 It is a little disappointing, even if also convenient for the pilgrim, that there is rarely much of a queue to pray at the Grotto of the Annunciation - unlike the Grotto of the Nativity in Bethlehem, which often has a queue of two or more hours. For most people the place of the birth is more significant; but it was in Nazareth that God first became a human being - an event in the history of the universe only comparable with His Resurrection thirty-something years later. Because of the relative lack of pilgrims, one can take time praying in front of the Grotto, contemplating the Incarnation, and adding a little note of thanks to the young lady who said "Amen" to God's loving plan. In his account of Mary's visit to her relative Elizabeth, St Luke writes of "a town in the hill country of Judea"(Luke 1:39). 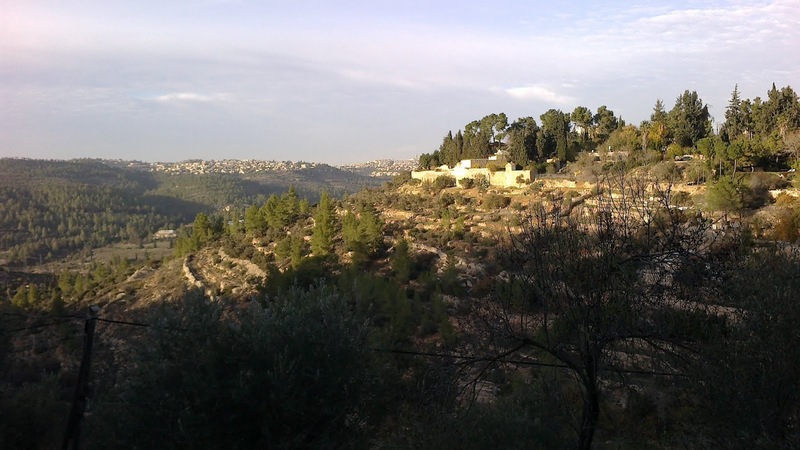 Tradition has identified this town with Ein Karem, which is now a village just outside western Jerusalem. My first impression when I walked out there is that it fits the description of 'hill country'. In fact it's quite a pretty location, popular with Jerusalemites for an afternoon out. The Church of the Visitation sits on a hillside a little way above the village centre, with a view across the valley that probably hasn't changed much since Mary (with Jesus on board) came calling. On the way up one passes "Mary's Spring": given that she stayed three months with Elizabeth, we can be sure she got water from it many times (assuming tradition has got the location right). Although pilgrims might content themselves with visiting the lower chapel of the church, which is supposedly the site of Elizabeth and Zechariah's house, the upper church is beautiful to see, and likewise its garden. Once again we find the key location is in a cave/grotto (and G. K. Chesterton expounds on the significance of that better than I ever could). But unlike what we saw in Nazareth, the place of Christ's birth is usually far from peaceful. The birth of a child is easier for people to relate to than the unseen moment of conception, so people flock in greater numbers to Bethlehem. The queue can often be two or more hours long. And once people have slowly shuffled forward for all that time, squeezing one by one through the bottleneck that is the grotto's entrance, the excitement cannot be contained and prayerful reverence is a lost cause. The pilgrims push forward to touch the star in the ground that marks the spot of the first Christmas, chattering to each other and asking each other to take photos of them (an extra complication that modern times have brought). A few feet away there is also the manger where the God-child was laid - a stone trough in a slightly lower alcove. For this as well the pilgrims push forward to touch it and to take photos (even when Mass is being celebrated in the alcove, as I discovered). I console myself with the thought that this is reality and that Jesus didn't come to be in a nicely-controlled, pious environment. We often depict the shepherds kneeling reverently before the baby Jesus; but they just as likely burst in upon the scene shouting with excitement, before proceeding to make cooing noises at Jesus while competing with each other to tell Mary and Joseph about the angels that had appeared to them. But at least they didn't take selfies. The Grotto of the Nativity aside, the church built over it can claim to be the oldest intact church in the Holy Land, and one of the oldest in the world. All the other churches in the region were destroyed in the Persian invasion of the early seventh century; but the Basilica of the Nativity was spared when the invaders spotted a mosaic of the Magi (aka the Three Kings) which depicted them in traditional Persian dress. My favourite feature is the Door of Humility: this main entrance was originally made smaller to stop the disrespectful from riding horses into the church, but the fact that one has to stoop low to go in has come to symbolise the humility of the Son of God in becoming one of us. Two mysteries of the rosary take place in the Temple: the presentation of Jesus as a first-born son, forty days after His birth, and then His truant episode about twelve years later. In addition, the Temple was of course the centre of Jewish religion and Jesus frequently visited it, prayed in it, and later also taught in it. The presentation of Jesus probably took place in the Court of the Women, that being the closest that Mary could get to the Holy Place. The finding of Jesus among the teachers of the Law may well have been somewhere in the Court of the Gentiles, perhaps among the outer colonnades where people could conveniently gather to talk and debate. 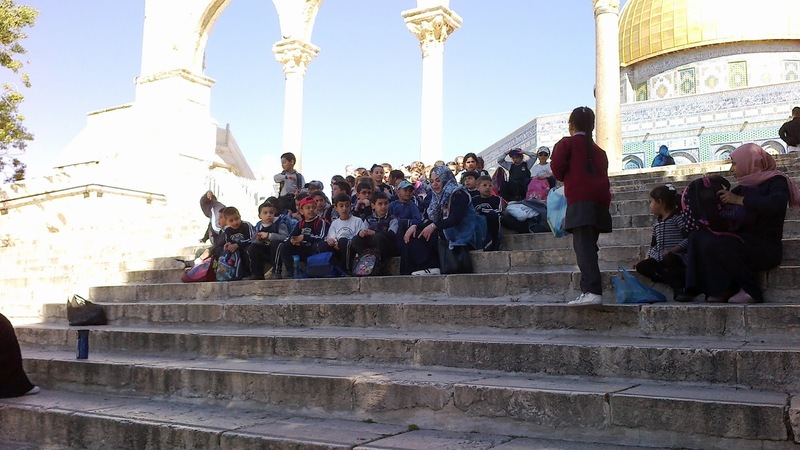 Even now it is common to see groups of Muslim children with their teachers. In his 17 years as a Capuchin Franciscan friar, Brother Paul has lived in Oxford, Toronto, Preston, Erith (London), and Jerusalem. He has now returned to the Capuchin friary in Oxford, where he is the pastor of the parish of St Edmund and St Frideswide. The opinions expressed on this blog are his own and are not necessarily those of the Capuchin Order.